Biosorption can be implemented as an immobilization technique for metal removal from wastewaters using either living or non-living biomass. The aim of this work is to study the biosorption process for Zn(II) and mixtures Zn(II)-Cd(II) by Pseudomonas veronii 2E, a microorganism with proven adsorptive capacity for Cd(II). 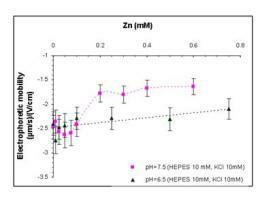 A 82% of total Zn(II) biosorption was achieved in 30 hrs at 32ºC and the isotherm results suited the Freundlich model. Cd(II) and Zn(II) simultaneous biosoption showed that all the adsorption sites are available for Cd(II), but only a fraction of them are for Zn(II). The electrophoretic mobility (µ) experiments that were performed with either Zn(II) or Cd(II)-Zn(II) mixtures supported these results. In addition, electrical properties of bacterial surface were studied by isoelectric point determination and µ variations examined at different growth states. Zn(II) and Cd(II) biosorption capacity of Pseudomonas veronii 2E makes possible its application as an efficient biosorbent in wastewater treatments.